These aren't your Pop's BDUs. 5.11 Tactical's Tactical Dress Uniforms (TDU®s) were designed to meet all of the MILSPEC requirements just like BDUs, but with the added tactical innovation that 5.11 brings to the table. What are those "tactical innovations?" Here's a few for starters: a bi-swing shoulder, removable neoprene elbow pads, 5.11's hidden document pockets, and Teflon® fabric treatment. 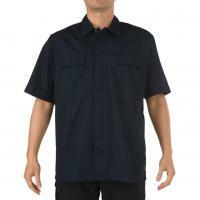 The TDU Shirt is available in 6.14 ounce 65% polyester / 35% cotton rip-stop or 5.78 ounce twill.